Cristina: I was born an artist. I’ve been drawing since I could hold a crayon, and it’s always come naturally to me. As a child I was captivated by fantastic and imaginative imagery, inspired by animated films, comics and picture books. I taught myself how to draw by studying other artists’ work, experimenting and practicing constantly, creating my own stories, characters, costumes and creatures. which gave me a good foundation to build upon. A job at an art supply store gave me access to a wide range of mediums and techniques that I voraciously explored, constantly striving to hone my skills. My first art job was doing window displays at a comics shop. After that I did illustration and packaging design for a toy company. I had a few issues of a small press comic published, and worked for several years at a role playing game company doing fantasy illustration, graphic design, conceptual design and some writing. I’ve also done some children’s illustration, murals and pin-up art. MBS: The use of symbols in your work is really quite striking. How did you become interested in symbolic art? Cristina: Thank you. I’ve experimented with symbolism in my work for a while, mostly in the context of a more figurative style, and it tended to be very personal symbolism. 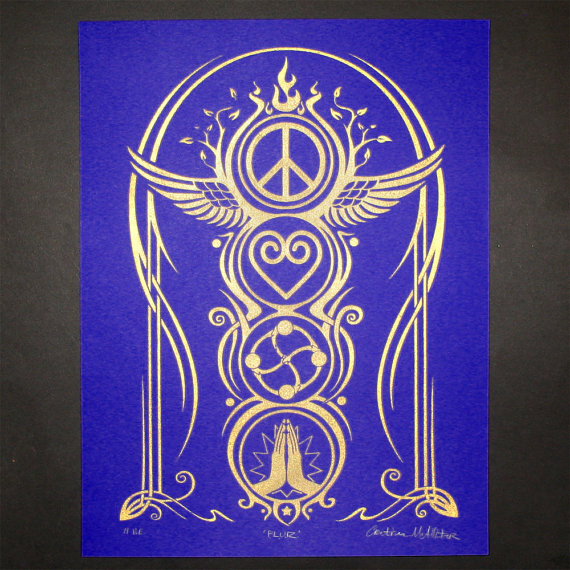 I began working with traditional symbols in a more abstract, decorative style fairly recently. 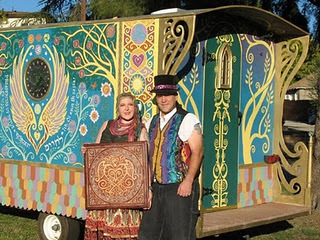 This style developed when my husband and I decided to build a gypsy wagon. He’s a maker – he can build with wood and metal, and fix anything. We combined our skills to create Calliope, a custom camper trailer that’s literally a work of functional art. The full story (with pictures!) can be found on my blog, here. When I started designing the artwork for Calliope, I was initially just interested in making her beautiful – my main focus was basically ornamental. But the more we invested in the project, the more I wanted to infuse some meaning into the artwork. 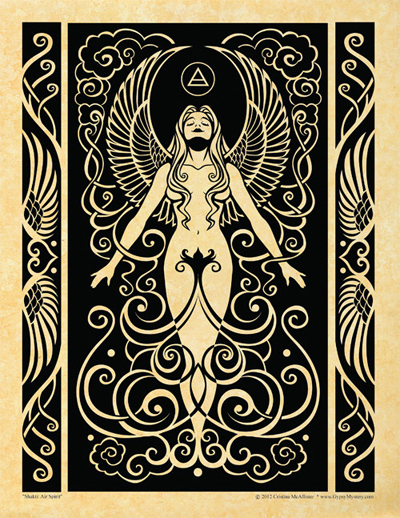 That’s when I began researching traditional symbolism, seeking ways to visually express what was important to us through my artwork. I’d always had a passing interest in the subject, but this time I found myself captivated by the use of symbols throughout history by different cultures. Visual language can be very powerful, particularly if it has been well established in a culture. These days we have access to such symbol lexicons from around the globe, so there’s a lot of material to draw from. One thing that intrigues me is the prevalent and fundamental use of symbols in religious and spiritual contexts. It’s incredible how very complex ideas can be encoded in simple imagery. I’ve also come to appreciate the notion of art beyond decorative, expressive or storytelling capacities. 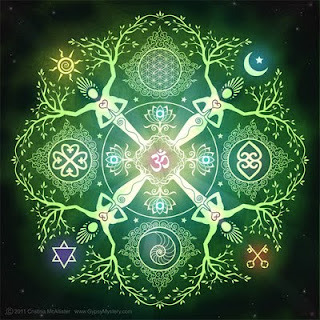 I began exploring the world of sacred art, such as mandalas, which can be a tool for focusing the mind, celebrating cherished ideas and communicating spiritual and philosophical concepts. I love the notion that a visual artwork can be both aesthetically beautiful and functional on a psychoactive level. 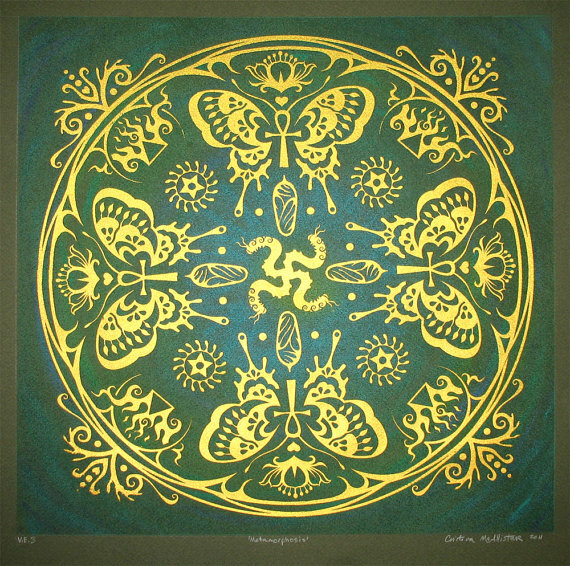 The outcome of this new direction is a continually-evolving style that integrates elements of Art Nouveau, Celtic knotwork, tribal design and organic forms. 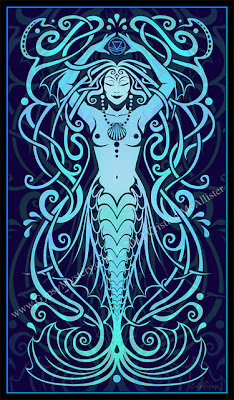 This style allows me to incorporate traditional symbols, combine them in new ways and create original symbolic images. MBS: Oh my! That Calliope is just gorgeous. You both must have had a great time designing it! I can see how your current, more decorative artwork has developed out of that. What are some of the materials you use when you create your pieces? Do you use stencils? If so, do you make your own? Cristina: The designs begin as hand sketches, which are scanned into the computer and finalized in Illustrator, which allows me to precisely control and adjust the imagery. The prints available in my Etsy shop are hand-pulled screen prints. 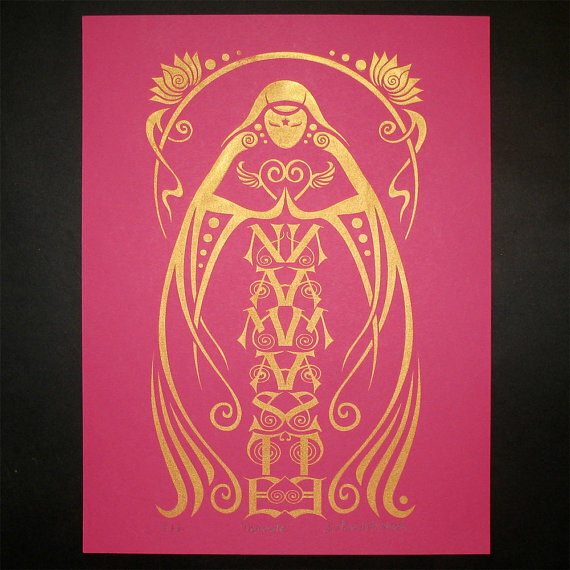 I envisioned these designs in metallic gold on richly colored backgrounds, and after some research, decided that screen printing would be the best way to achieve this. Dore (my husband) and I educated ourselves on the process and got to work. He’s in charge of making the screens, which involves a darkroom and photosensitive goop – that’s his department! I do the actual printing on a simple press he built for me. The larger, variable-edition prints actually have unique hand-painted backgrounds. Each print is an original work, the field behind the design painted with pastels in various colors and patterns. I really like the contrast of the very matte pastel texture and the shimmering gold ink. The smaller prints are printed on colored fine art papers or scrapbook paper, which I find suits my needs quite well. Its high quality, archival paper and you can find subtle patterns that add a nice dimension to the work, as opposed to a flat single color background. MBS: It sound like you and your husband collaborate well together! The prints, what size do you like to work with? 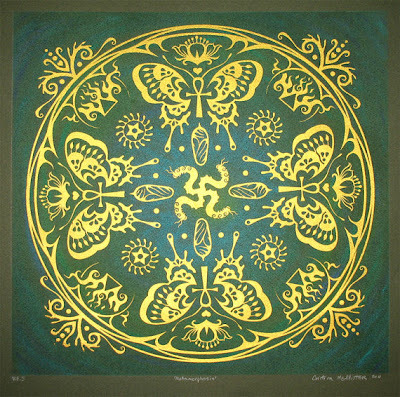 Cristina: I’ve done a range of sizes, from “mini prints” (5” x 5”) to my larger mandalas, which are 14” x 14”. We aren’t really set up to do anything larger at the moment. But I think that’s a good size – big enough to grab your attention and present the details well, but not overbearing! I like to make a variety of sizes and price levels available. MBS: What do you find so appealing about the printmaking process? Cristina: I used to just make original paintings, but I would put so much effort into one single piece and in order to price it to value my time, it would end up being more than most people were willing or able to pay. So – I have a lovely collection of original works adorning our home! Printmaking is a way for me to make my work more available and affordable to more people, and yet it still has the quality of being handmade by the artist, so it retains that creative energy. My style also lends itself to the medium – the crisp edges and complex patterns really shine through. 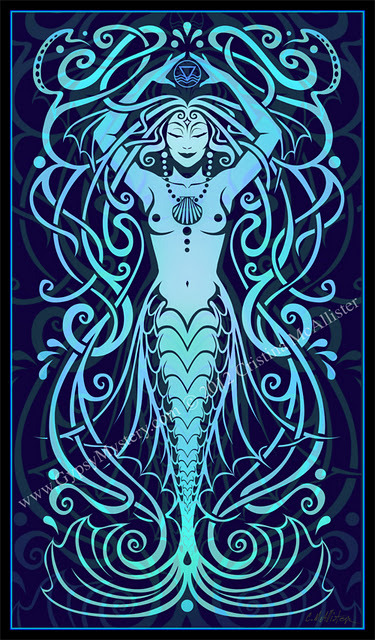 Cristina: As far as new work, I’m currently working on a series called “Shakti”; very ornate decorative designs that include symbolic elements and female figures that represent various themes. I’m also working toward making my work more widely available through catalogs, other retailers or publishing companies that have more distribution. Ideally, I’d love to have someone who could do the marketing part for me, but that doesn’t seem to happen much in the art world these days, so it’s a DIY situation. I’m striving to get better at that aspect of my career. MBS: What is a typical work day for you? Do you keep "hours" and go to your studio like a 9-5 job, or are you less scheduled about it? Cristina: At the moment I have a part time job, which takes up the middle portion of my days. Generally, my mornings are spent on the computer checking email, maintaining my blog and Etsy shop, doing online research, etc. My afternoons are for working on new designs or making prints, working on other projects, errands, housework, etc. I tend to fluctuate between periods of intense art focus and periods of creative downtime. Sometimes my Muse hits hard and I’ll spend every available moment working obsessively on new designs. This weekend was like that – the weather was gorgeous, but I spent most of it on the computer working on my Shakti. I did manage to get out and get some fresh air and activity in, though. MBS: Your blog, website, Etsy shop - it sounds like you really do quite a bit online to help promote your work. I know so many artists who really still avoid the whole online aspect for their business. What has your online experience been like? Cristina: The internet is such an amazing phenomenon…it has opened up the world like never before. There’s the potential to connect and share with millions of people. The flipside of that is that there is SO much stuff out there! It’s easy to get lost in the clutter. You don’t want to “spam” people, but you DO want to let the right people know you exist – the people who can appreciate and enjoy your work. I think blogs like yours can really help facilitate that, and I’m excited about this opportunity to connect with your readers. One thing the internet is great for is getting feedback – from all kinds of people from all over the place. That can be very inspiring. Of course, it can be frustrating when you’re getting a ton of feedback and few actual sales, but I think it’s kind of a critical mass game. The more exposure you get, the more familiar you become to people, the more your work builds value on a collective level. I used to be kind of reluctant to put my stuff out there – afraid of the potential for people to just steal my images without giving me any credit or compensation. It certainly does happen, but I’ve come to accept that as sort of an investment. I just try to remember to put a watermark with my name and website on everything so people can track me down if they want to find out more! MBS: What advice do you have for those who wish to seriously pursue an artistic path? Cristina: Well, on a practical level, I would advise getting some fundamental business and marketing education, so you have some idea of the tools necessary for getting your stuff out there and dealing with the Making-A-Living aspect of an art career. On a creative level, I’d say never stop exploring and trying new things, new mediums, new styles, even if it’s just for fun. Every technique I try my hand at teaches me something and adds to my creative voice. Cristina McAllister's artwork can be found in her Etsy Shop, her website - Gypsy Mystery, and Fine Art America. She also does freelance illustration and graphic design work.